Goodbye Tube150, Hello Year of the Bus! 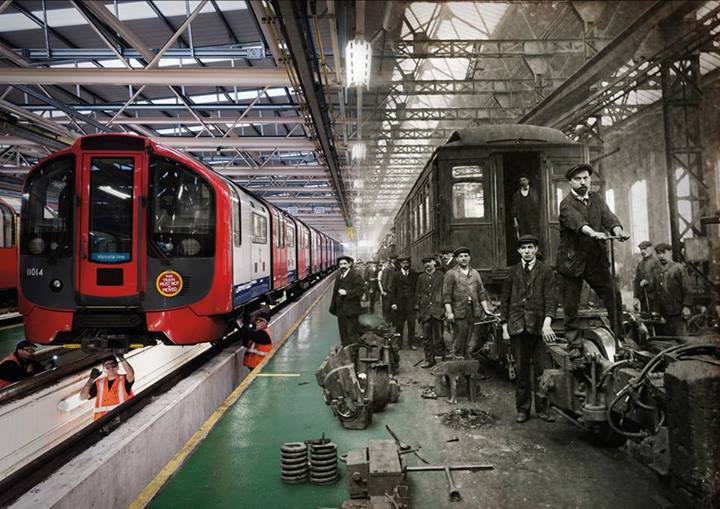 The year of the 150th anniversary of the London Underground has been the most remarkable year for London Transport Museum since we opened in Covent Garden over thirty years ago. The organisation of the associated celebratory events and projects was a massive undertaking. From the planning of a public programme based on a new social history of the Underground, the undertaking of two innovative restoration projects – Metropolitan loco no.1 and Jubilee carriage 353 – and the operation of steam hauled special services within the original London Underground tunnels of 1863 to arguably the Museum’s most extensive special exhibition, Poster 150 – London Underground’s Greatest Designs, in newly extended galleries. All of this, along with the opening of the disused station at Aldwych throughout November, was delivered with huge success to record audiences. Indeed, Tube150 provoked broad public interest in London, well beyond the rail enthusiast, and this was echoed by worldwide press coverage. The Underground’s own reputation soared to a new high in January 2013 and throughout the year the Museum experienced record levels of patronage for visits, corporate events, fundraising, retail, online trading and access. 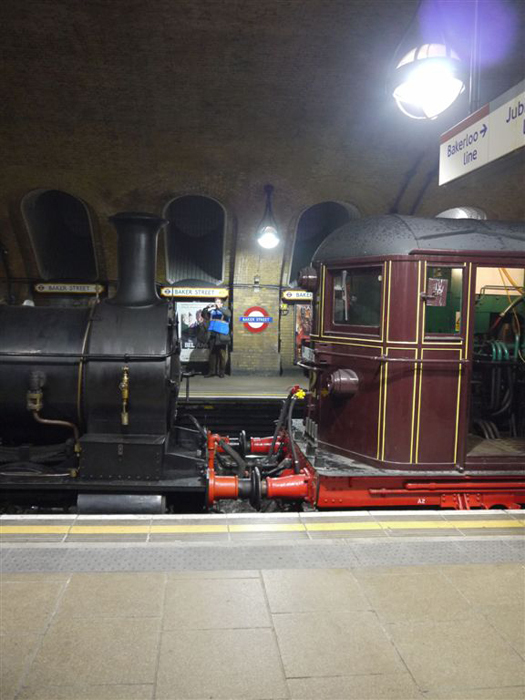 In December 2013, a remarkable year was crowned by the Heritage Railway Association making its premier award to the Museum and Transport for London (TfL). That the Peter Manisty Award should be given to the busiest metro in the world is a reflection on just what was achieved in 2013. When did an operating railway, let alone one of the world’s busiest metros, win industry and public recognition for such an enlightened attitude to its heritage? During the year, the steam trains have run over 350 miles and conveyed nearly 10,000ticket holders, guests and staff in a self-funded service with no delays to the travelling public. Only an organisation confident in its abilities and respectful of its unique heritage could have encouraged us to work through the myriad of operational constraints to operate steam amongst service trains. This was achieved by a team drawn from a number of areas in the Underground – timetabling, line operations, test crew drivers, rolling stock, heritage trains – and to such a professional degree that there was no interruption to the service. This award-winning year is no flash in the pan. Having built up such momentum and expertise within the Museum and Underground team, 2014 will see another busy programme of steam-hauled events on Underground metals. 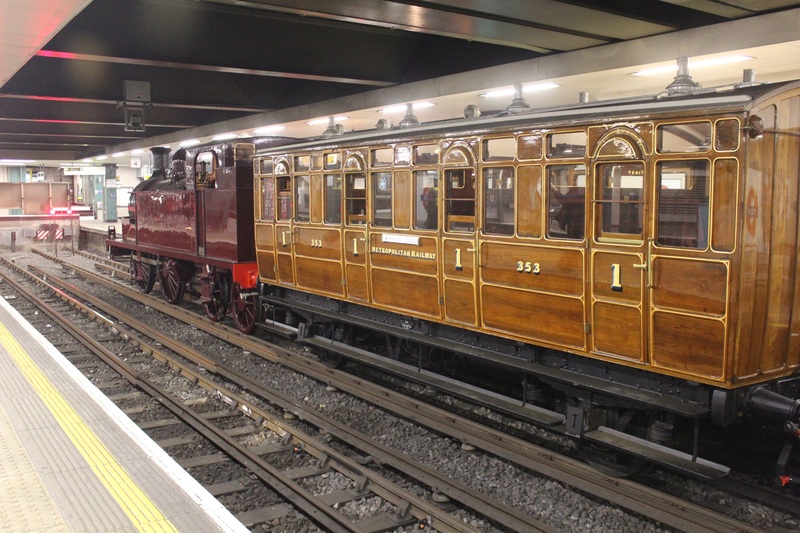 The Bluebell’s Ashbury set will return in August 2014 for the celebration of the 150th anniversary of the Hammersmith & City line’s opening in 1864. Met no.1, the milk van, carriage 353 and the Bluebell rake will run on two Saturdays, 2nd and 9th August, from Hammersmith into Moorgate and back. The following weekend, 16 and17th August, steam will take over the Chesham branch for the first time since 1962. Steam services will run from Rickmansworth, with the replacement bus service for the branch being complimented by a heritage bus service. Tube150 has broadened and deepened support for our Museum. Delighted with the profile of the anniversary, TfL has asked us to similarly programme with them for future years, starting with a Year of the Bus in 2014, sponsored by Exterion Media. The success of the year has deepened our relationship with sponsors such as Cubic, Siemens and the former CBSO, and funders such as Heritage Lottery Fund and the Arts Council, and created new relationships with over two hundred individual donors. We are translating this support into a new Patrons Circle and aiming it initially towards our Battlebus project, with the restored B2737 to participate in the commemoration of the centenary of the outbreak of the First World War later in 2014. 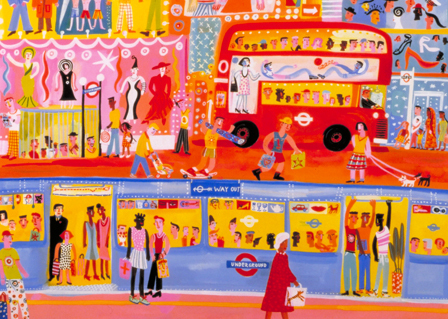 As we move from Tube150 into the Year of the Bus, we can reflect on the power of well planned and meticulously delivered heritage events in central London to engage Londoners and to attract external sponsorship. In June 2014, we will bring a cavalcade of historic buses to Regents Street, a unique gathering of 25 vehicles dating from 1908 to the New Routemaster, to mark the contribution of the motor bus to London since 1898. 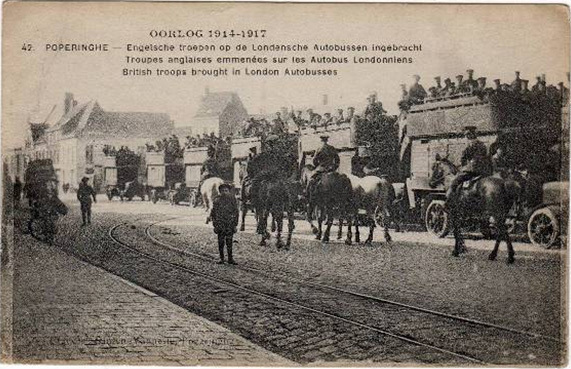 We will deliver a range of community events at bus garages around London, present fresh insights into London during the First World War in our Goodbye Piccadilly – from the home front to the Western Front exhibition from May and return our restored B-type bus to Flanders in September and October as part of the centenary commemorations. To find out more about London Transport Museum’s events programme, including heritage vehicle runs, visit www.ltmuseum.co.uk. You can also sign up for the Museum e-Newsletter, and follow on Facebook and Twitter. 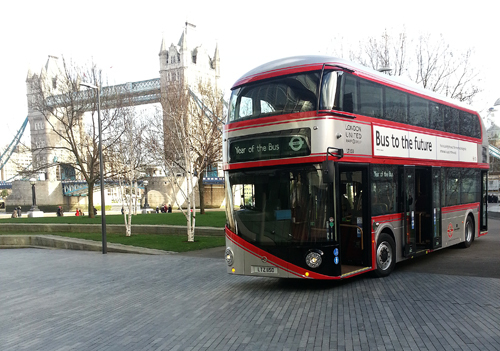 Back in December, we tested Met 1 and coach 353 from Earls Court to Moorgate to prepare for the celebration. 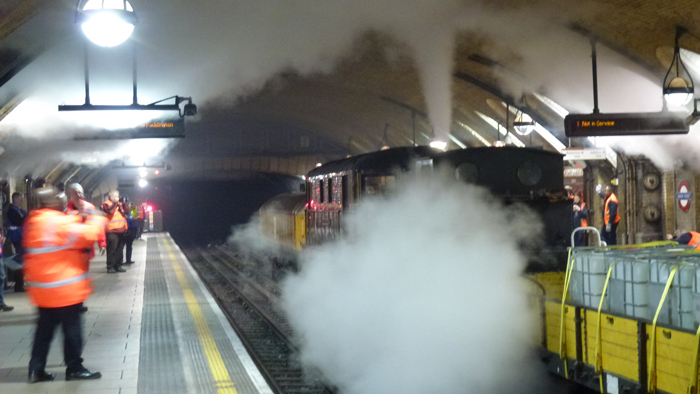 For me, it was a remarkable experience to see both our restored vehicles arrive under steam at Earls Court early in the morning of 16 December. The unlined maroon Met 1 pulled quietly into the platform, the varnished coach glinting in the lights behind, cameras were deployed and then followed the cry of ‘All aboard’. We climbed into the plush red seats of one of the four compartments, lit by the Pintsch patent gas lights (LEDs actually), and the doors were slammed shut. With journalists, and our donors and trustees, I sat expectantly on the plush bench seat and noted the gilded mirrors, buttoned leather door panels, string net luggage racks and rich lettering. Richard Jones opined that this was one of the best restorations he had ever seen. The guard blew his whistle, was answered by the engine whistle and we lurched forwards as the coupling slack was snatched up. The loud beat of the engine quickened and echoed off the tunnel roof as we pulled away, the view on both sides being obscured by smoke and steam. We let one window down on its notched leather strap to get the full effect of steam coal into the compartment. The engine worked quite hard as it tackled the gradient up to Kensington Church Street. For the first time, we began to get just a hint of what travelling on the Victorian Underground might have felt like, the noise of the engine, the movement of the carriage and the swirl of the steam outside the window. We passed through modern stations such as King’s Cross/St Pancras, a rather surreal experience looking out from a varnished teak upholstered interior onto a modern functional platform with its bright roundels. Orange-clad station staff and contractors smiled and took pictures as we rattled through brightly lit but empty platforms. 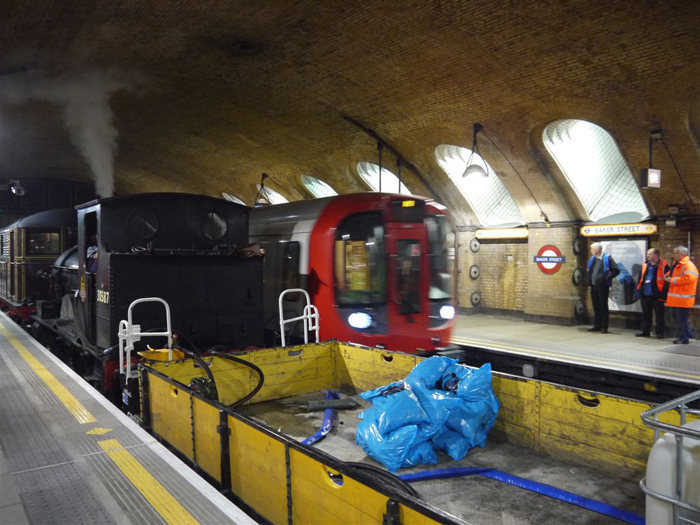 An unexpected red signal at Baker Street led to the engine blowing off and bringing down the accumulated dust, soot and dead pigeons of the past 150 years onto the pristine carriage and loco. We nosed into the bay platform at Moorgate to take on water before making the return journey to Edgware Road. This is the experience I hope many of you have been able to taste on the January commemorative runs. Tickets have inevitably been limited and expensive but this is a one-off event, expensive to mount and unlikely to be repeated. 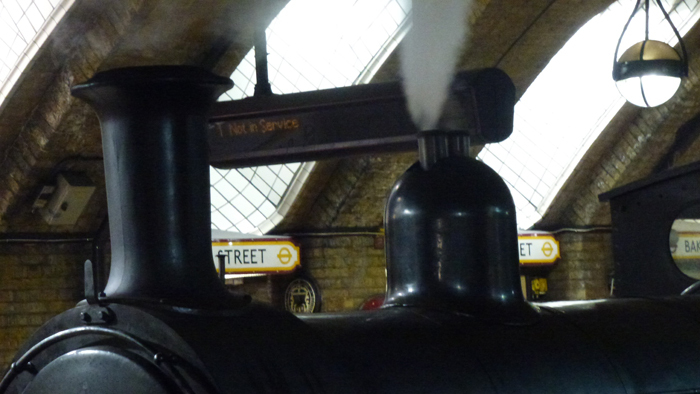 To run a steam hauled service of original carriages within the normal Met timetable has been a huge privilege and a great event to lead off the celebration of the Underground’s profound influence on the capital over the past 150 years. There will be further opportunities throughout the year to ride behind Met 1; from Harrow to Amersham in May and September, at Quainton Road in August and at Epping-Ongar in June and even a Santa Special in December. Negotiations are in hand to hire the loco and coach to heritage railways in the coming years and spread the Museum’s message through a volunteer supporters group to explain them and illustrate the restoration process to a wider public. 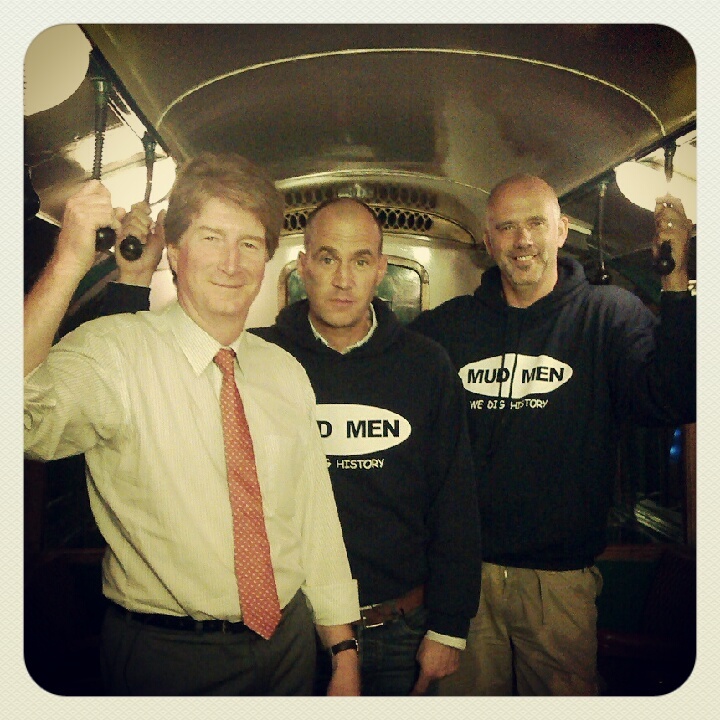 Our two projects for 2013 have been the most significant we have undertaken since the 38-stock restoration nearly ten years ago. 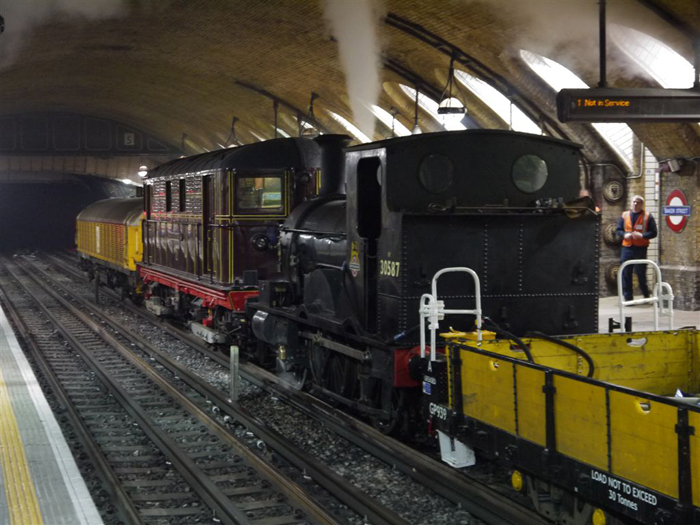 It’s the first time we have ventured into steam overhaul and operation and we have the eight to ten year life of the boiler certificate to carry the story of the Met and the world’s first underground railway to locations and audiences within and beyond London. We hope to pair it as much as possible with Met 353, our first Met carriage and seen on the test night as one of the highest quality restorations of its type. Great tribute is owed to the Friends for backing this work from the offset two years ago, to our contractors at the Ffestiniog and for the excellent and thoughtful direction of the project by Tim Shields. If you are one of over two hundred individual donors, many thanks from the board and myself. My first visit to the Boston Lodge works of the Ffestiniog Railway to see our restoration in progress. 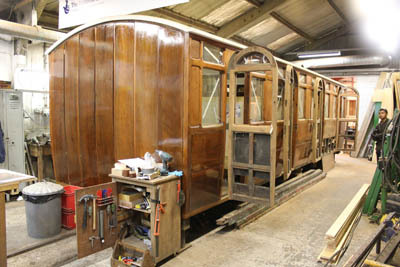 The carriage body is now nearly complete, with the teak panelling restored and revarnished. Work has started on fitting out the four compartments with their bench seats. The repairs and filling of gaps and holes has been beautifully done, just discernible from close up but not from a distance. It is already hard to reconcile the carriage in its present state with the tired body removed from our store at the start of the Project. The two holes for the Pintsch patent gas lights to be dropped into the ceilings can be seen in each compartment. The wooden strakes, window corners and mirror surrounds were seen in the varnish shop ready for addition to the body. Much work has recently been undertaken on cutting down the ex-BR under frame to fit the body. The Ffestiniog guys have resisted the temptation to go for the 2ft and I can report the under frame is definitely standard gauge! We came away most impressed with the knowledge and workmanship of Norman’s team and our apprentice. Work is on programme and we look forward to 353 taking its place behind Met 1 later in the autumn for running in.